a habit to use the forks, spoons, etc. in a stack, but put them away after washing on the bottom. do this is when you first notice the silver beginning to darken. Maas or any good metal polish should clean them up nicely. 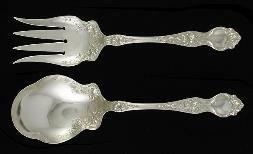 very dark tarnish in the nooks and crannies of certain flatware patterns can be a very desirable thing to have. and enjoy your newly lustrous silver. use a scrubber-type sponge as it can leave unsightly scratches. the look of your flatware forever. mayonnaise; acidic foods such as vinegar, ketchup, mustard, salad dressing, onions, and fruit juice; and salt. taken to keep silver away from these items. damage machine buffed or ground out. Never, ever use dips, sprays, or the "aluminum foil and baking soda in the sink" routine to clean your silver. mentioned earlier. Toothpaste should also be avoided as it is highly abrasive.